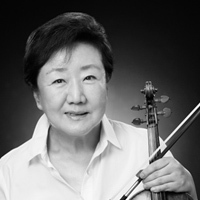 Nam Yun Kim, one of the most famous violinists and professors in Korea, has served on the juries of numerous competitions worldwide such as Queen Elisabeth Competition, Tchaikovsky Competition, Tibor Varga Competition, Hannover International Violin Competition, Taipei International Competition, and so forth. Kim made her grand debut after winning top prizes at the Tibor Vargas International Competition upon studying at Juilliard School of Music with Ivan Galamian and Felix Galimir. As a promising soloist, Kim was invited to perform at many internationally renowned venues such as Carnegie Hall, Lincoln Center for the Performing Arts, Kennedy Center, Sydney Opera House and other major concert halls in Europe and Asia. She also performed with major orchestras throughout the world including St. Petersburg Symphony, Royal Philharmonic, Zagreb Radio Symphony and many others. Kim has also been invited to many famous music schools and festivals such as Jacobs School of Music in Indiana University, Toho Gakuen School of Music, Tibor Varga Academy, Escuela Superior de Música Reina Sofía, etc. For her great contribution to music making in Korea, she received the Prize of Ok-Kwan Medal, The Prize of Korea National Academy of Arts and she became a member of the National Academy of Arts of the Republic of Korea in 2016. Currently, she has led the Violin Orchestra and the Korean Soloists as each music director. She is the President of Korea National Institute for the Gifted in Arts and the Honorary Professor of Violin at the Korea National University of Arts.